Brett Favre has been in the news a lot lately, but not for his on-the-field exploits. It’s more like his off-the-field sextsploits that get Favre media attention these days (because he’s been terrible on the field and should have stayed retired). Now, I’ve avoided covering Brett Favre’s groin until now, but finally something happened with Brett Favre’s batch that made me laugh, not cringe, cover my eyes, and look away. 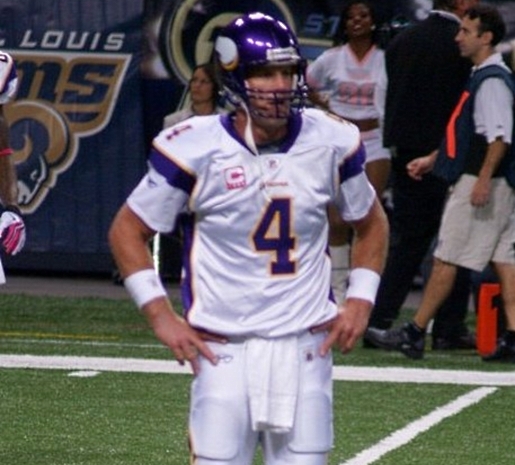 Yesterday, in practice with his Minnesota Viking teammates, Brett Favre got his in the groin with a football. Now, lots of people are making the reference to The Simpsons, namely the bit where Hans Moleman gets hit in the groin by a football and doubles over in a similar manner. Aside from my post title, I’ll not do that. After all, Moleman didn’t deserve his suffering, but Brett Favre sending dirty text messages to someone young enough to be his daughter while his wife was battling breast cancer? That deserves the pointy end of a football directly in the family jewels. This is what happens when you have your pants on the ground, Brett.